Join us for our annual HallowMead party, Oct. 27th. 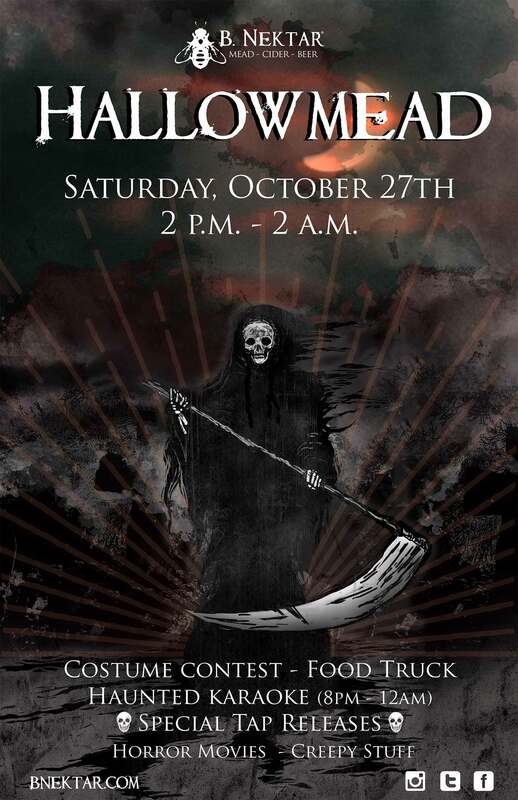 B. Nektar’s annual Halloween spook-tacular is on October 27th! Join us for a mead and cider-centric Halloween party in our taproom from 2 p.m. until 2 a.m. There will be skeletons and jack o’ lanterns and cider and mead! Horror movies will burn visions of terror into your mind as classic goth and metal sounds pour from the speakers! Haunted Karaoke starts at 8 pm! Wear your terrifying best- there will be a costume contest at 10 pm! We’ll also have some special tap-only releases! …and yes, there will be candy! Next Post: She’s Our Quizmaster, And She’s Crazy: A Stranger Things Quiz!